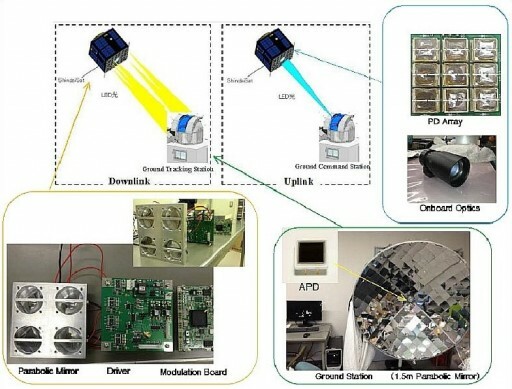 Visible Light Communications Technology (VLC) is an emerging method along with various laser communications applications for future spaceflight missions. Using high frequency modulation, the LED output can be used as a data transmission. VLC has a number of advantages such as an unlimited bandwidth, no electromagnetic interference, no danger to health, a low power consumption and easy application. Disadvantages include security concerns as the light is visible to everybody, narrow coverage of the VLC sources and the limited distance of visibility. 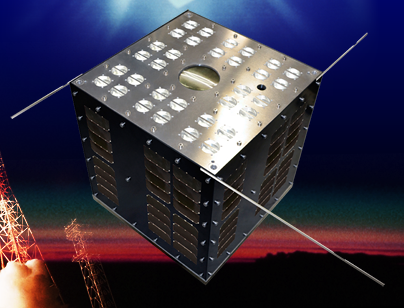 ShindaiSat is a cubical satellite with a side length of about 40 centimeters. Its main structure is comprised of an aluminum frame and composite panels. Four internal double cross panels provide installation locations for the different satellite systems. Four side panels are covered with solar cells that feed a Power Distribution Unit that regulates the state of charge of three batteries and transfers power to the various satellite systems. A total of 96 gallium-arsenide cells are installed on the satellite each cell being 40 by 80 mm in size. Li-Ion batteries are used for power storage with a capacity of 3,100mAh. The satellite has a peak power generation of 24W with an expected average of 10 Watts. Peak power consumption is 126 Watts during VLC operations, in standby mode, the satellite requires 6W of power. The attitude determination and control system includes a GPS sensor, sun sensors, magnetic sensors, a three-axis fiber-optic gyro and MEMS gyro to accurately determine the satellite orientation and rates. Active attitude control is provided by reaction wheels on two axes (pitch & roll) and magnetic torquers on all three axes. Precise Pointing on the yaw axis is not required for the VLC payload to complete its mission. The attitude control board processes attitude sensor data and actuates the reaction wheels and torquers. The satellite uses two downlink frequencies at 437 MHz for UHF downlink at 1200bit/s and two frequencies at 145 MHz are used for command uplink via VHF achieving the same data rate. The satellite uses conventional rod antennas that deploy after separation from the launcher. The main payload of the spacecraft is the VLC package that is installed on one external panel of the satellite that is pointed to Earth for payload operations. The LED units used on ShindaiSat provide an output efficiency of 140 lumen per Watt. The payload uses high gain LEDs and low-gain LED s.
The high gain LED unit can achieve data rates of 1.2 and 9.6kbit/s by using 32 LEDs installed in the focal plane of 32 parabolic mirrors to reach an output of 10,000 lumen at 90W power consumption. The irradiation angle is low at 6°. Using the mirrors, the LEDs illuminate a spotlight circle on Earth that has a diameter of 40 Kilometers that defines the communications area on the ground. The high-gain system uses Continuous Wave CW modulation. The Low-Gain LED system consists of one LED unit (4 LEDs) installed on each side panel of the satellite – creating an irradiation angle of 110 degrees which ensures that at least one LED can be detected from any given direction. The Low-Gain LED output is 1,900 lumen and CW modulation is utilized once again. The system achieves lower data rates, but unlike the high-gain LEDs, the low-gain system achieves omni-directional coverage at lower power consumption. 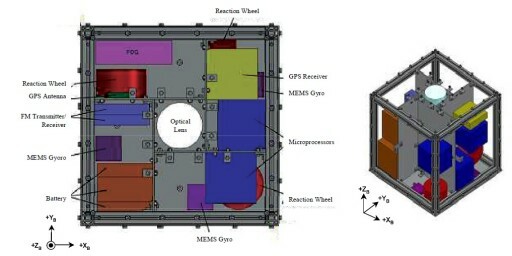 In the center of the nadir satellite panel is an optical receiver that will demonstrate optical uplink capability. It is a photodiode array that is capable of detecting the modulated light uplink from a ground station. The main ground station for VLC testing involving ShindaiSat is located at Shinshu University in Nagano. Because VLC communications rely on clear atmospheric conditions, mobile units are under development. 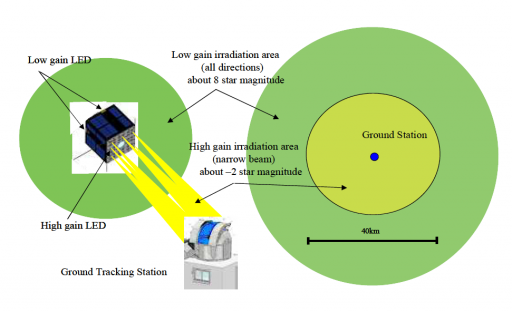 Within the 40 Kilometer footprint around the main ground station are a number of institutions that also have the capability of receiving the VLC data because only a 1-meter mirror telescope is needed to detect the signal. 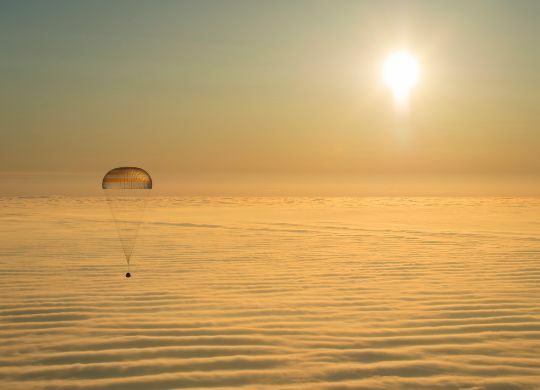 It is hoped that ShindaiSat can lay the foundations for future VLC evaluations for application in spaceflight and on Earth.